Then Epstein just let the disclosure sit there with no additional follow-up. His story has what is in my view a deliberately "this is boring" headline ("Division over platform at DNC" ... zzz). However, it would appear that the folks over at the Associated Press got to Epstein's third paragraph, and went into full-keister-covering mode. ... Obama intervened directly to get the language changed both on Jerusalem and to reinstate God in the platform, according to campaign officials who insisted on anonymity to describe behind-the-scenes party negotiations. They said Obama's reaction to the omission of God from the platform was to wonder why it was removed in the first place. That is, Obama had noooooo idea that this had happened, and cleaned things up. A stirring speech by former President Bill Clinton and a surprise appearance by President Barack Obama seemed - for a moment at least - to take the sting out of back-to-back glitches that upset Obama's carefully scripted convention. In a matter of hours, Obama's team dealt with a potentially severe weather forecast by moving his Thursday nomination speech to a smaller, inside venue. Under criticism from Republicans, Democrats hurriedly added references to God and Jerusalem to the party platform. The goal when both unexpected issues arose was to move quickly to minimize risk, lest the president look disorganized and uncertain just a day before he takes the stage to make his case for a second term. ... Lambasted by Republicans, Obama and party officials pushed through amendments that declared Jerusalem as the capital of Israel and added a call for a government that lets willing workers make the most of their "God-given potential." But a chaotic scene on the convention floor and three inconclusive voice votes only drew more attention. Inserting God and Jerusalem in the platform, which had been approved the day before, required a two-thirds vote of the delegates. 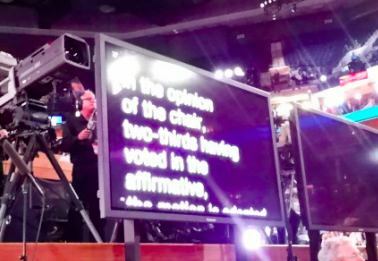 When Los Angeles Mayor Antonio Villaraigosa, the convention chairman, called for a voice vote, the ayes and nays were equally loud. He called for a second. The result was louder but still uncertain. Villaraigosa appeared to look for help from the sidelines and then called for yet another vote. He then declared the amendments passed. Zheesh, Jim. The result wasn't uncertain at all. There is no way the "yes" shouts were twice as loud as those opposed. There is no way the changes passed on a voice vote. Villaraigosa was told by a handler how to deal with it (as seen in the video and quoted here -- "You've got to rule, and then you've got to let them do what they're gonna do") and told by his teleprompter (as seen here, telling him to say "In the opinion of the chair, two-thirds having voted in the affirmative ...") that the amendment was going to be deemed as passed by a two-thirds majority no matter what the "yes" and "no" sound levels were from the floor. Kuhnhenn never said what Obama knew about the pre-Thursday platform or when he knew it. What resulted is a textbook example of how the Administration's Press whitewashes events.